Taoism is a Chinese philosophical, spiritual, and religious tradition which dates back thousands of years and which has many branches. Bruce Frantzis, the teacher of our teachers here at Toward Harmony, is a lineage holder in the Taoist water tradition. 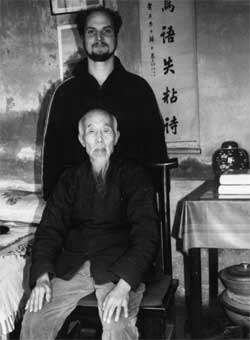 He was a disciple of the late Taoist sage Liu Hung Chieh, who traced their lineage back to Lao-Tse, author of the Tao Te Ching. This seminal text of the water tradition is well known - it is one of the most translated literary works in the world. Less well-known, however, are the meditation and qigong methods that form the core spiritual practice of this branch of Taoism. The water tradition gets its name from its approach to life and spiritual practice. You learn how to relax, let go, and open your body, mind, and spirit. This allows you move in harmony with the natural flows of life. You learn to flow - like water - around obstacles outside and within you so that you gradually wear them down and realize inner peace and clarity. One distinguishing factor of water tradition practices is that they are very kinesthetic. Rather than using visualization to move energy, a practitioner learns to directly feel their own body and its energies in great detail. Another key characteristic of the water tradition is what we call the 70% principle. This entails only training to 70% of one's capacity at any time, and in all aspects of practice. Practicing this way avoids strain and tension, which allows both the mind and the body to relax and open. Everything we teach at Toward Harmony is infused with the core principles of the Taoist Water tradition.